Margaret and Roger are pleased to welcome you to stay at Bois Langlois. Our 19th. century, restored farmhouse is situated in Chartrené, a small, picturesque country village in the Loire Valley, an area famous for it's wine and it's chateaux. 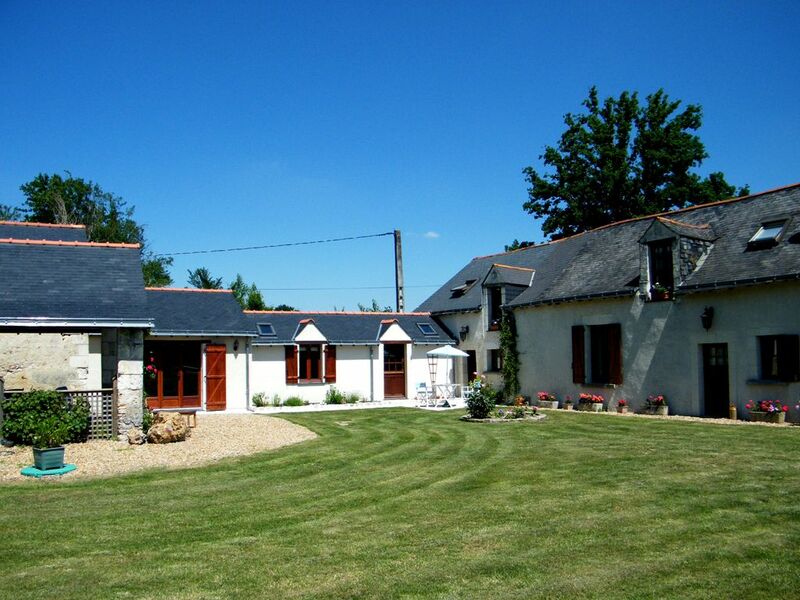 Bois Langlois is just outside the village in a peaceful location overlooking woods and fields. The gite is situated in a separate wing of the farmhouse. It has 2 double bedrooms and a single. One of the double bedrooms is on the ground floor. There is a shower room with toilet, comfortable lounge and dining room and well equipped kitchen. WiFi is available. Outside is a covered eating area with bbq and views over the garden and surrounding countryside. Complimentary supplies of tea, coffee, milk and wine are available on arrival. Restricted use of our overground swimming pool (until 6pm each day) is available at your own risk and we are happy to welcome children over the age of 12. Although the gite is in a separate wing of the farmhouse it is totally private with your own outside sitting and eating area. We are on hand to answer any questions but will respect your privacy. We are also within easy reach of: •BAUGE our local town you will find an imposing chateau, a local market twice a week and an excellent golf course. 10 mins drive.o•LA FLECHE situated on the banks of the river, Le Loir, an interesting town with a very large outdoor market every Wednesday morning. 30 mins drive.•SAUMUR with its fairytale chateau overlooking the river, La Loire, and home to the famous equestrian riding school "Cadre Noir". 40 mins drive.•ANGERS a busy vibrant city with excellent shops and restaurants, and the Chateau which houses the famous Tapisserie d'Apocalypse. 40 mins drive.•LE MANS home, of course, to the famous 24 hour motor race but also an interesting city steeped in history. 1 hour drive. Ideally placed between the two rivers La Loire and Le Loir you will find much to see and do, from exploring the beautiful countryside, tasting the local wine and produce, visiting local markets and special village events or just relaxing in the peace and tranquillity to be found at Bois Langlois. We can also arrange an escorted explanatory tour ( in English) to a local vineyard.